This is my last column of the 2017 outdoor season of the Aurora Farmers Market and Artisan Fair. We will close at the end of the market day next Saturday, October 28. We will then move indoors to the Aurora Armoury building for the following three dates: Saturday November 11, Saturday November 25 and finally Saturday December 9. We will return for our usual outdoor season on Saturday, May 5, 2018. This time of year, traditionally, has been our busiest with the autumn harvest bringing an abundance of fall fruits and vegetables. At the same time, there is still a great selection of produce available which has been maturing for some time. For example, last Saturday I saw that the Coopers still had some strawberries as well as the last of their corn. Willowtree Farm had some beautiful fall raspberries, so sweet that they almost didn’t make it home. 19th Avenue Farm still had Italian prune plums alongside many varieties of apples. In general, the farmers’ tables are groaning under the weight of all the produce currently available, and so much more fresh and local than what you’ll find at the grocery store. 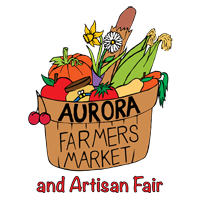 You have only one Saturday left to take advantage of all the Aurora Farmers’ Market farmers have to offer, so do plan to be there on our last outdoor day. Let me introduce the final new vendor of this season. You will have noticed that we once again have had oven baked pizza available this year. Il Fornetto Pizza is a small catering company run by Salvatore Sauta whose goal it is to make authentic Italian style pizza. He trained in Italy at a Pizzamaker Professional School and trained with a master and world champion pizza maker. He has many years’ experience working in restaurants where he specialized in many different styles of pizza and in his special Pizza Art. You have one week left to try his delicious thin crust pizza at the Market. to be as creative as you can and to bring your carved pumpkin entries to the Sponsor’s Booth, just inside the park, by 10am. We will also be having entertainment which is in the final stages of confirmation. Weather permitting, there will be pumpkin bowling again for the children. We want to create lasting fond memories of your Market experience to carry you over the winter until we reappear in May. Now we’d like to offer a profound Aurora Farmers’ Market and Artisan Fair thank you to our wonderful and generous sponsors of this year’s Market. Without your kind generosity we would not have been able to provide the wonderful entertainment or to have the advertising ability we enjoyed this season. We are so grateful to you all.